Lichtenstein [b. New York, 1923] studied briefly with Reginald Marsh at the Art Students League in 1939, and for the next three years pursued a normal academic course at Ohio State College. His education, interrupted by service in the Second World War, was completed at Ohio State College, and he taught there until 1951. From that date until 1957 he lived in Cleveland, and thereafter taught at New York State University before settling in New York itself. Since 1951 most years have seen a one-man exhibition in a New York gallery. When Lichtenstein's painting first claimed wide attention, 1960-1, it was because his work was diametrically opposed to the then dominant Abstract expressionist School. He employed banal subject matter derived from advertising and the mass media, and seemingly copied from sources so obvious that everyone knew them; his techniques, too, seemed to derive from mass-production. His large paintings would reproduce the screen of dots familiar to all newspaper readers. Lichtenstein's art was calculated in the extreme, leaving no room for the personal gestures and sensual paint effects to which everyone had become accustomed. His renditions of comic strips and paintings based on Erle Loran's diagrams of portraits by Cézanne, or paintings by Picasso, were seen as bitter satires on the most meretricious elements of American life, the consumer society of television sets and washing-machines. Yet within the limits of this subject matter Lichtenstein displayed remarkable concern for classic modes of composition and a brilliant sense of color. 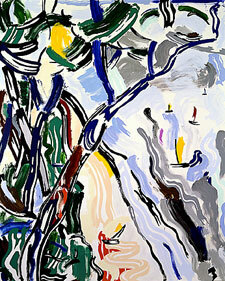 He had adhered to the flat pattern as few American artists have done since the 1930s. Since 1964 narrative has been less important in his art; he has turned increasingly to landscape themes which give a freer rein to his feeling for elegant design: landscapes, abstract compositions and take-offs of Abstract Expressionism (Large Painting 6, 1965), sometimes compositions based on Art Deco, pictures of mirrors and rather complex still lifes. Many of his drawings are self-sufficient works, independent of any paintings (six variations, becoming progressively more abstract, on the theme of Bull, 1973; variations on the theme of the Artist's Studio, 1974). Lichtenstein has also turned his talents to prints, his style adapting itself perfectly to lithography and silk-screen (Rouen Cathedral, 1969). 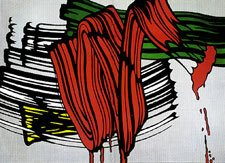 The parallel between Lichtenstein's formal organizational schemes and those of the younger abstract (Minimal) artists has often been noted, but his true importance lies in the new complex relationship between the banal subject and the sophisticated abstract structure which he, as a protagonist of Pop Art, helped to reintroduce into American art. Lichtenstein's development as a mature painter was marked by his propensity for working in successive series or thematic groups. The later groups tended to be interpretations and to some extent parodies of earlier Modernist styles -- Cubism, Futurism and Surrealism. In the early 1980s Lichtenstein created sculptural maquettes constructed from flat shapes as three-dimensional graphic imitations of German Expressionist woodcuts. These, like his series of painted or sculpted brushstrokes of the 1980s, painstakingly created an ironic suggestion of spontaneity. In the late 1980s and early 1990s he returned to the use of Ben-Day dots in a new and refined application of his earlier style. 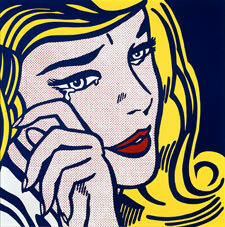 Roy Lichtenstein died in September 1997.